I think they turned out great! You have such a beautiful family – inside and out. I think you are being much too rough on the pictures. They look great. Sophies hair looks fine. The kids look happ. I mistook Tori for you initially. My family gets to do this n a couple of weeks. Do you thnk I can lose 20 pounds in 4 weeks? GORGEOUS!!! Beautiful family, inside & out! Great photos!! It’s a BEAUTIFUL, BEAUTIFUL family! Thanks so much for sharing the photos…it made my day! I just can’t believe how fast they’re all growing up! Tori looks so beautiful, I hadn’t seen a pic of her in a while! And Sophie lost her “toddler” thing, when, exactly? She looks like a little woman!! Where does the time go? 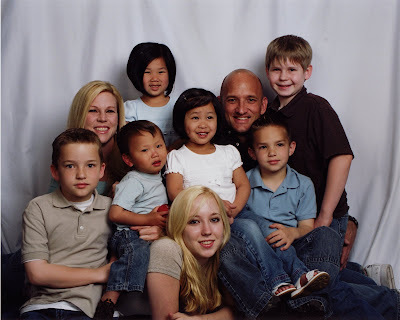 Love the pictures – I always get a little suspicious when I see the ‘perfect’ family picture — who’s kids act like that anyway? Too cute, all of you! I think they are GORGEOUS, GORGEOUS, GORGEOUS Stefanie!! You have such a beautiful family!!!! I love how you wrote of the joy of the day and the joy of your discovery of how the pictures turned out!! Loved it. I get excited when pictures are taken and then I am, usually, disappointed. But they are SO important. And your family looks fabulous NO MATTER WHAT!!!! You crack me up with your take of it all! They are great pictures!! Your family IS beautiful inside and out. Great pictures! We have to do the same thing this week. I hope ours turn out as good. Oh my goodness, your way to hard on yourself. These pictures are great! I don’t see any flaws. What a beautiful family! Great Pictures! I think he has that quiet serious look going, very cute!! Gives me hope that we can try this once Gracie is home. Beautiful pics!! Everyone did an awesome job. Can’t wait to see little Shepherd in there too! These pictures are beautiful!!!! What a blessed family! It’s a great shot! It’s a huge accomplishment to get everyone bathed, dressed, hair done and all together in the same place at the same time with any sense of peace and calm. You have a gorgeous family. I know those photos sessions can be rough. A few years ago we met the photographer at an arboritum. It was fall..the gardens were beautiful. The kids were dressed in white clothing and looked lovely. Toward the end,when the photographer was taking individual shots, the boys snuck off and had a rotten apple fight in the orchard. Needless to say, they were covered with brown apple slime and never got their individual shots taken. Rotten apple stains never come out of white clothing!!! I’m LOL-ing at Jude’s corralled hands!! Sooo cute! They all are. Just stunning!!!! What a beautiful family! and, I must say, my first thought was how much I LOVED how Sophie’s hair looked – can’t imagine how darling it was ‘fixed’! lovely, I have only two but I dread trying to get them situated for a photo! I love it!!! Josiah is at that stage where he tries to fake smile and he squishes his eyes up like Jude and while sometimes annoying, it is so doggone cute at the same time!! I love the look on Isabelle’s face too! You can see the personality in the kids’ faces! I say BRAVO for attempting the family photo shoot! We haven’t had anything but a few family snapshots since Josiah’s homecoming in August! Can’t wait to see an UPDATED photo shoot with Shepherd!! Ya’ll did great Stefanie!!! I think they are cute!!! You have such a lovely family Stefanie. I too think it turn out great. It’s a great picture & the only thing missing is Shepherd! 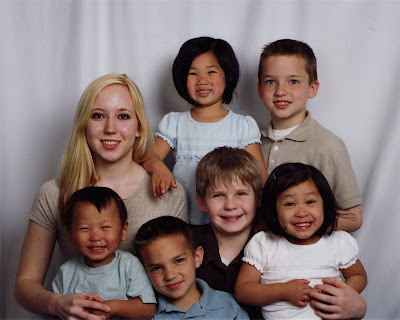 I too wondered where the rest of Tori was in the bottom picture & then realized, she’s the foundation…holding up all her siblings….=) Too Cute! The pictures are amazing… wow, how did you accomplish that!?! Sophie just cracks me up. I have many, many pictures of Ben with that smile! HA!! Loved it! Your family is gorgeous – all of you! And I love the expressions. It brought back fun and funny memories! We had a series of about 4 years when Shaggy experienced extreme sensitivity to light, the idea of light, the suggestion that a bright light was coming, you get the picture. So for those four years, darling chubby Shaggy was squinty eyed, and bloodshot in EVERY. STINKIN’. PICTURE! Wow! I think they turned out FANTASTIC! What a beautiful family. The kids look so happy! It just makes me smile!!!!! Next year there will be one more precious face in there!!!! I sent out your squares yesterday! BEAUTIFUL photos! And little Jude in that first one?!? Oh my, he’s adorable! I’m taking Oakley on Saturday to have her first professional photo taken. I so hope we’re successful. I’d love to get a family photo, but still haven’t recovered from the Christmas card photo session:). What a gorgeous family!!! Just stunning.